Usually Ships in 19 Days. Publisher: Sterling Publishing Company Inc. 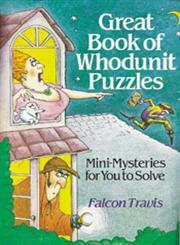 The Title "Great Book Of Whodunit Puzzles: Mini-Mysteries For You To Solve" is written by Falcon Travis . This book was published in the year 1993. The ISBN number 0806903481|9780806903484 is assigned to the Paperback version of this title. The publisher of this title is Sterling Publishing Company Inc.. We have about 5448 other great books from this publisher. Great Book Of Whodunit Puzzles: Mini-Mysteries For You To Solve is currently Available with us.